A handful of new housing projects in east Boulder, some just being completed and some only in the concept stage, promise to shift the city’s population center eastward and could significantly change the character of their surroundings. 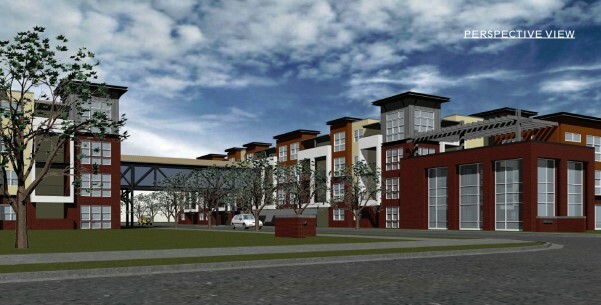 Waterview, 288 rental units on an empty site on the north side of Arapahoe just west of South Boulder Creek, which was given a chilly reception when the Planning Board considered a concept plan this week. If all the projects are approved and completed at their proposed scales, they will add up to over 1100 new units that could come on the market within the next few years. The result could be a marked change in the character of an area that currently is dominated by industrial, office, and some retail uses. All five projects are within or very close to one census tract, bordered roughly by 28th St. on the west, Arapahoe on the south, 55th St. on the east, and the Diagonal and Independence on the north. In the 2000 census, this tract had a population of 6,125 and an average household size of 2.0 people, with a 50-50 split between rental and owner-occupied units. If the new units also averaged a household size of 2.0, they would bring an additional 2,200 people to the area, raising the population in the census tract by over a third from the year 2000. This could add energy and vitality to the east end of town, parts of which are almost deserted at night and on weekends, and could give a boost to local stores and restaurants. It could also add to the traffic congestion in an area whose urban design is still heavily auto-centric, with large roads at wide spacing rather than the denser grid found in older parts of the city. And it could increase pressure on city services in the area, such as the East Boulder Recreation Center and nearby fire stations. The city has planned on significant growth in the eastern part of town for some time. The Boulder Junction design calls for a total of 1400 to 2400 units at build-out, and the current update of the Boulder Valley Comprehensive Plan focuses on changes east of Folsom. But these projects are among the first to start making the concept a reality. The city has also tried to address the downsides of the growth. According to information from city staff, “There was concern initially about increased traffic with the redevelopment of the Boulder Junction, and as a result, [the Transit Village Area Plan] calls for a high percentage (55 to 70 percent) of all trips to be made by non-single occupant vehicles.” The plan uses parking maximums, managed parking, increased bike parking, and other tools to try to achieve this. Although the city says it hasn’t received any application materials for the second phase of the Peloton, Michael Brunette, a salesperson for the Peloton, says the project will start “soon,” most likely this year. The shell of the buildings is complete, so the phase 2 project just involves completing the interior build-out. Brunette said in his observation, the siting and design of the Peloton were successful in allowing residents to reduce their use of cars, saying many of the residents walk to King Soopers for groceries or to 29th Street to shop. Asked if he was worried about the competition from other new housing projects that will be coming to the area, he said no. “We fall into our own niche,” he said. The Waterview project’s future is uncertain at this point after a lukewarm response from the Planning Board. Waterview’s site is particularly challenging to plan. It has the benefit of bordering South Boulder Creek and the parallel multi-use path, but its only street access is to Arapahoe, which in this location has six lanes and fairly high traffic speeds. To its west is a self-storage facility; to its east, across the creek, is a car dealership. In the view of city planning staff, “Both the Peloton and Waterview provide opportunities to create a finer grain [street] network and [bring] residential uses into industrial single-use areas which often have a more suburban form.” However, creating an attractive design that maximizes the benefit of the creek and multi-use path and minimizes the effects of the industrial surroundings, while anticipating the possibility of future redevelopment of neighboring properties and the creation of a street grid in the area, will be a challenge for the architect and city planners. Residential use is allowed within industrial zoning districts, with certain restrictions and subject to city review. 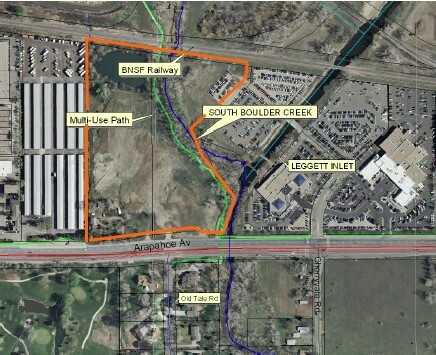 As a result, other large swaths of east Boulder that are zoned industrial are ripe for redevelopment with housing, particularly those with older and smaller buildings and those adjoining Boulder Creek, South Boulder Creek, Valmont City Park, or open space. Seems like a developers dream, or, too much of a good thing??? We need more Peloton projects like we need a whole in the head.